This queen of the desert demonstrates all of the features we desire for a tough yet beautiful addition to the landscape. Beyond its tolerance for dry and difficult sites, brilliant deep pink flowers bloom in abundance over a long period in late spring and early summer. The shiny blue-green leaves are serrated along the edge, adding to the plant’s ornamentation. In late summer the leaves take on a burgundy caste, complimenting the warm colors of the fall garden. Smooth gold to tan seed heads appear after the flowers fade and may be left on for winter interest. Hummingbirds find the flowers irresistible and songbirds eat the seeds. This regional beauty is an important nectar source for native bees and honey -bees. 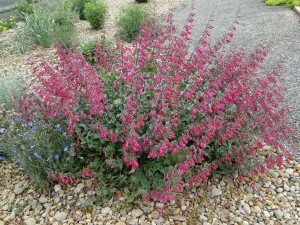 Desert beardtongue is a robust plant that shows up nicely in the garden or curbside. Give it plenty of room to allow for good air circulation and to maintain its naturally beautiful form. Water: Dry to xeric best. Culture: Clay with good drainage, or sandy soils. Not too much humus. Thanks to Gay Bechir, Echter’s Garden Center for this piece.